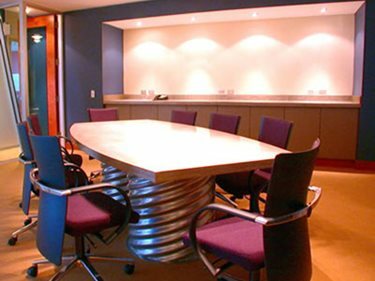 When it comes to office furniture, employers and employees favor desks and tables that are functional and stylish. Custom-crafted, one-of-a-kind concrete furniture inspires conversation. It creates a favorable, lasting impression with both clients and employees -- an impression that will echo positive feelings. Concrete furniture can be used in the lobby to make an impression, to highlight your company's brand of individuality. 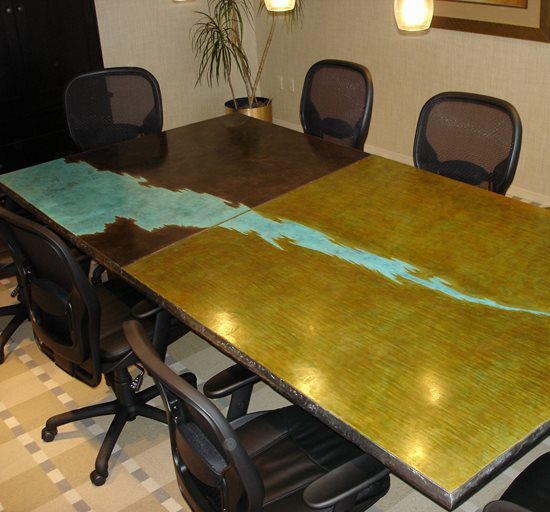 Concrete can be molded into any shaped conference table you'd like. The possibilities are endless -- as are the possible colors and textures. "People are after a different look. Something that has more character and craftsmanship, and is more of a natural component." There's a growing trend toward building with natural materials such as stone, rock, and concrete. That trend is being taken into the workplace. With modern methods of staining, coloring, and treating, any look can be achieved. The end results also yield a piece of furniture that is durable. DEX Studios uses a high performance, high strength proprietary mix design for fabrication of all products that yields a product with high compressive strength, high abrasion resistance and low porosity. Rod Woods of Patina Studios has created some unique ones. The countertop he produced for an architecture office conference room sports a rock streambed embedded in the countertop. The client had a general idea about wanting an aquarium or waterfall. So, trying to incorporate that idea into the countertop, water flows underneath an aquarium, falls off the edge of the countertop and into a lower countertop pool. "It's just basically the natural look and feel that is so appealing to many. And the design aspect is limitless. You can manipulate it to do whatever you want -- you can do things you just can't do with other materials." The possibilities for creative expression with concrete are endless. Each concrete artisan approaches the craft differently, achieving a distinct "signature look" by building their own forms, developing special casting techniques, and using proprietary materials and coloring methods. Because each piece is made to order, the customer can also provide creative input. Some designers and architects choose concrete because it's something different. "The design community is very excited -- and that's the most important measure. When the architects and designers favor a material, they'll continue with it."